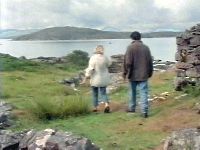 Uags is a rather inaccessible location (except by boat) which appeared in "In search of a rose" (series two). The easiest (if most expensive) way to reach this location is by boat. Directions by road are only given for the sake of completeness. Plockton to Stromeferry. Then A890 to Strathcarron passing Attadale House (the house used as the major's house in the series). The A896 to Tornapress, then take the minor road on the left to Applecross. Go past the Coire nan Arr which appeared in Wee Jock's Lament and over the Bealach na Ba (one of the highest roads in the UK) to Applecross. From here take the road to Toscaig at the bottom of the Applecross peninsula. Uags is three miles further down the peninsular but the walk is not recommended. 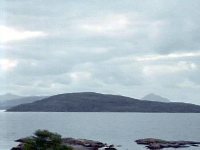 Similar views of the Crowlin Islands (Lochdubh Island in the episode) can be had from the vicinity of Toscaig with a lot less effort. Other views of the Crowlin Islands can be had from Frithard Road in Plockton and from the bottom of Skye - there is a good view from the Skye bridge looking towards them and Uags.